Now posting newspapers from 1960 - Please let others know about this website. 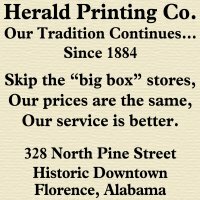 In the interest of preserving the heritage and tradition of The Shoals Area, We will begin posting issues of The Florence Herald. 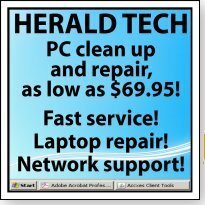 The Herald, which exists today as Herald Printing and Technology Co., was a weekly newspaper that was established in 1884 and published for many years by Marcy B. Darnall, my great grandfather. 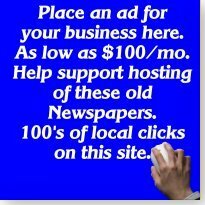 The articles and advertisments include many businesses and people that are still around today. I have decided to start posting the editions begining in 1958. You will find many articles of interest including bank reports, political articles and social postings that are fascinating. You may even find a wedding, birth or death announcement of a family member or friend. 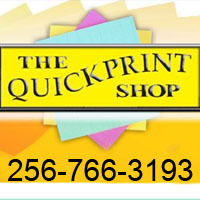 We are offering the service of reprinting and laminating any article of interest for a small fee. The image that your document will be reprinted from is a high resolution image. The newspapers on this site are reduced for internet efficiency. Please call the Herald at 256-764-0641 to order. Below, you will find links to the issues that have been posted so far. Additional issues will be posted regularly as we scan them. You will need to have Adobe Acrobat Reader to view the files. These files are limited for printing, but they are able to be saved locally to your drive. They are protected by copywrite. Zoom in and read the articles. Each issue is about 4 megs, please allow a minute or two while they load. Add your email address to be notified when new papers are posted. If you enjoy these old newspapers and wish to contribute to the cost of scanning, hosting and bandwidth related to the digital archiving of this historic newspaper, click below. Thank you!